This is our Martinetti ™ Tiger Prawn Luminous Squid Jig model from Colman's Fishing Supply. Sizes - From nose to end of hooks. You'll find that these squid jigs are quite similar to the Yamashita Squid Jigs, Yo-zuri Squid Jigs, but at a lower price. The luminous quality of these squid jigs really attract the squid. For best results, charge up the squid jig with a light source for a few minutes before fishing, the squid will instantly be drawn to the glowing jig under the dark water. All these squid jigs come in complete retail packaging. These are VERY effective, high quality squid jigs, used throughout the world for catching squid. You will find this to be a POPULAR item in your squid fishing tackle box. It is a good idea to have a variety of different colors available, as squid will often hit on different colors better than others at times. 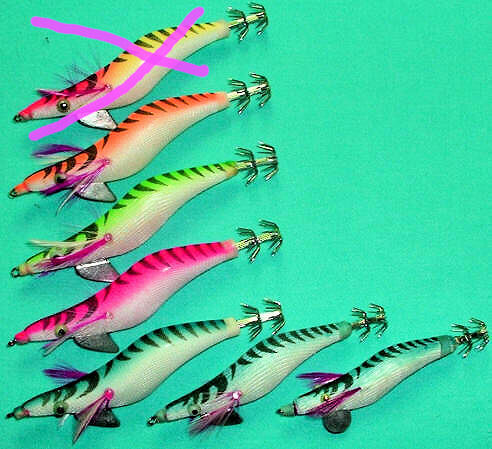 Look elsewhere, and if you can find them, these jigs are selling for at least $7.00 USD each!!!! "Hey Jon, please let me know if your new styles came in yet. Also wanted you to know that I used your jigs this weekend. This is not the peak season so the squid were tough to catch but I out gunned the other fisherman, 6-1. I also gave out your site to a few people on the bridge." You might also want to try these with our Underwater Squid Fishing Lights. Be sure to check out ALL of our Leisure style of squid jigs, they are quite similar to other manufacturers that you are probably familiar with such as Yo-zuri squid jigs, Yamashita squid jigs, Martinetti squid jigs, Juicy Jigs squid Jigs. Our new models are Parannah Luminous Squid Jig, Puget Sound Squid Teaser Squid Jig, Rainbow Fish Luminous Squid Jig, Sunset Wave Squid Jig, Tiger Fish Luminous Squid Jig, and Tiger Prawn Luminous Squid Jig. You will be impressed by the high quality.